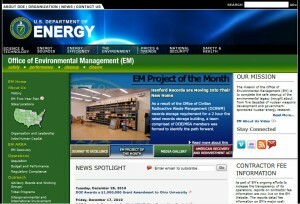 The mission of the Office of Environmental Management (EM) is to complete the safe cleanup of the environmental legacy brought about from five decades of nuclear weapons development and government-sponsored nuclear energy research. EM is constructing and operating facilities to treat radioactive liquid tank waste into a safe, stable form to enable ultimate disposition. EM is securing and storing nuclear material in a stable, safe configuration in secure locations to protect national security. EM is transporting and disposing of transuranic and low-level wastes in a safe and cost effective manner to reduce risk. EM is decontaminating and decommissioning facilities that provide no further value to reduce long-term liabilities and maximize resources for cleanup. EM is remediating soil and ground water contaminated with the radioactive and hazardous constituents. EM is fulfilling its commitments to reduce risk and complete cleanup across all sites for the generations to come.